Five years ago when I began researching the ethical implications of using unmanned aerial vehicles (UAVs) in journalism, a trusted mentor told me it might not be the best choice for a research agenda. After all, I couldn’t be sure drones would ever truly become a “thing” in newsrooms. Fast-forward to this spring, when that same person asked me to do a drone demo in their class. Drones are, indeed, a thing in journalism, and they’re only going to grow. This leaves educators — already exhausted from keeping up with nonstop innovations from podcasting to Snapchat — wondering how to deal with this new tool. Do we all really have to now develop pilot and airspace expertise in addition to AP Style, interviewing, law, ethics and a dizzying array of platform options? The short answer is: “No.” Not every J-School instructor needs to be licensed to fly a drone. But, I would argue, every one of us needs to understand drones as a tool and a trend, and every program should be thinking now about where and how we can incorporate them in our curricula. When Congress set the Federal Aviation Administration on a course to figure out how to safely incorporate UAVs in the national airspace, they did so in part because civilian drones were something of an inevitability, but also because they were certain to become big business. Some analysts argue drones in the U.S. could be a $100 billion concern by 2020. Drones offer safety, convenience and cost efficiency to industries well beyond journalism. Insurance companies are interested in them to verify damage involved in claims. Golf course managers can deploy them to manage watering practices. And meteorological researchers can monitor weather with them. That reporting, however, falls under what the FAA labels “commercial use.” For the agency charged with determining how drones can be used, such commercial uses mean stiffer regulation. Hobbyist users have constraints, as well, but commercial users now are required to get what’s known as Part 107 certification before using drones. Whether use of drones in journalism education qualifies as a commercial use is not a settled question. 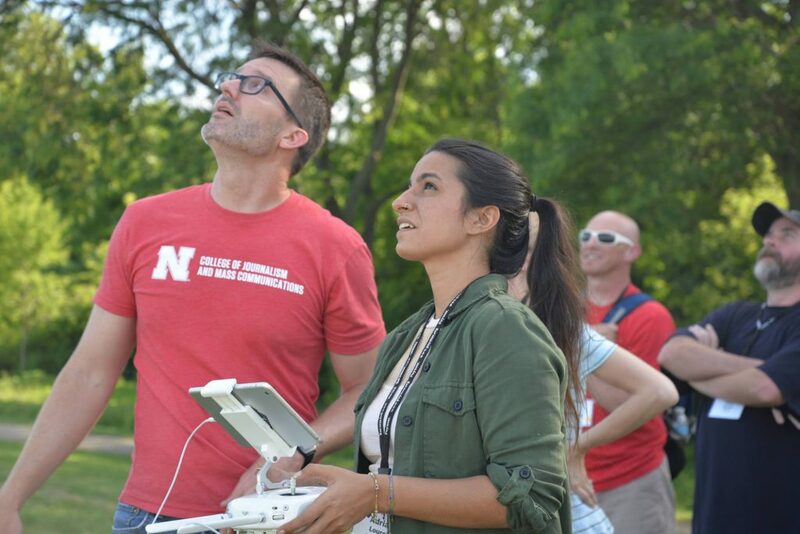 But the safe and responsible choice for educators looking to incorporate drones in class reporting projects is to ensure a 107-certified and sufficiently insured pilot in command is on hand for all drone flights. That may be the instructor or a student or a local journalist you partner with. The FAA allows applications for waivers for such things as night flight or flight over people, though the latter is rare. The next step is further due diligence. Waite notes the complexity of FAA rules and cautioned that it’s not enough to rely on students or others who claim they’re registered or licensed. Educators need to truly dig in and understand the legal environment and ensure that operations are safe and lawful. “The consequence of you getting it wrong is your students facing $10,000 fines,” he says. Beyond the legal restrictions lay a series of ethical considerations that are essential in any classroom using drones. The Center for Journalism Ethics that I direct at the University of Wisconsin-Madison released a report this summer on public acceptance of drone use in news. We found a public modestly favorable toward these uses but clear in preferring them in certain types of reporting and not others. People are concerned about privacy, surveillance and paparazzi-type behavior. The Center recommends transparency and accountability when using drones, including such things as always labeling drone footage and images and linking to means for the public to respond and ask questions. Tompkins says careful news media use, including by students, is critical in and of itself, but also as a means of preserving access to using drones as reporting tools. It’s also key to remember that drones should be incorporated within curriculum and not added on as some shiny new object in a dedicated course. Waite feels particularly strongly about this point. One of the things I noticed as I have worked on research in drones is the healthy set of cross-campus connections I’ve been developing. Given that these tools can be useful in everything from monitoring crops to tracking whales — literally from agriculture to zoology — journalism schools can become campus leaders in demonstrating safe and responsible use, as well as influencing institutional policies. Kathleen Bartzen Culver (@kbculver) is the director of the Center for Journalism Ethics and was the founding education curator for MediaShift. This story is posted here in an agreement with MediaShift. The original post is found here.